Welcome to the peaceful, relaxed and friendly resort of Siam Phuket. 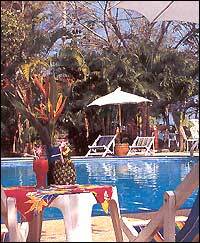 The resort offers 50 rooms situated around the beautifully landscaped gardens with swimming pool. Designed with total relaxation and comfort in mind and paying attention to the small details that guests appreciate. The friendly management awaits you. - Internet benefits includes 10% discount for tours bookes through "Siam Tour"
- Guests pay direct to Hotel, a 50% deposit is requires 1 week after reservation is made. Specially designed to provide total relaxation and comfort, the resort offers 50 air-conditioned rooms around the beautiful landscaped gardens with swimming pool. - Standard rooms are 17sq m with one queen size bed, hot & cold shower, telephone and balcony. Located at beach side offering refreshments and snacks. The swimming pool is open from 08:00 am until 20:00 pm. The pool is the only one at Rawai Beach and is meticulously maintained. Snacks and beverages are available at pool side on request.